Community politics, Orange Book, Social Liberalism. Time for the Lib Dems to move on. After its electoral catastrophe followed by a surge of mostly younger members, the Liberal Democrats are struggling to create a new future. The immediate focus is on selecting a new party leader. I’m not going to comment on that further today. I think it is more constructive to think about the sort of party the Liberal Democrats should become. It has something like a clean slate to work with – which makes it an excellent moment to put the past into perspective and move on. As ever it is easier to see what should be left behind than the shape of the future. Let’s start with “Centrism”. The party’s outgoing leader, Nick Clegg, was fond of saying that the party was “anchored to the centre ground of British politics”. The meant that the party was pitching for voters convinced by neither the left nor the right. Centrism is not an ideological anchor, though, it is an electoral tactic. It is arguably a necessary one in order to break through in Britain’s electoral system, though its deployment this year as the basis for the party’s national campaign seems to have had little impact. The party actually needed to mobilise voters of the left and right to vote tactically – so it was wide of the mark. Centrism may return, but defining yourself in reference to others is not a good place to start. The next idea worth mentioning is Community Politics. This was an idea developed by Liberals before they merged with the SDP to form the Lib Dems in 1988. This is a very locally based form of politics, which involved the party inserting itself into local communities, and encouraging these communities to take more responsibility for their own affairs. It showed the practical power of liberal values: openness, readiness to talk with others of different views, and self-help, rather than waiting for the government to sort your problems out. When it worked it could draw in a wide diversity of people, and establish the party at the centre of a local community. It was how the party managed to extablish its local government base. But there are two problems with it. First is that few people have the patience for it. Local communities are weakening in our more mobile and connected world. Certainly where I live there is nothing to work with. Local communities invoke nostalgia, and coming together in a crisis, but not the everyday practice of politics. Doubtless there are exceptions – and we should not accept the weakening of local communities as inevitable and irreversible – but it is much harder to practice it these days. The second problem is deeper – it sits ill with national politics. The party’s spell in national coalition devastated its local government base. There is a widespread view nowadays that for community politicians a party label is a disadvantage. You have more credibility as an independent. The next idea to leave behind is Orange Bookery. What is it? You probably won’t get much idea from reading the Orange Book itself, published ten years ago, if you can find I copy. It drew a wide variety of contributors from many strands of thinking. It came to stand for what could be called Westminster liberalism. The sort of liberal ideas popular amongst the elites in Westminster – a lighter touch from government, and the empowerment of individuals through private choice in public markets. There is strong emphasis on education to give all people an equal start. This strand of thinking (close to my own) never really took hold amongst grass roots activists, but it heavily influenced the sort of people who were able to win parliamentary selections, and hence become MPs – it dominated the party’s national leadership. These included Mr Clegg. They were heavily criticised. For some they were simply too right-wing; others felt they were too distant from activists; yet others felt that they were corrupted by being paid-up members of the Westminster political class – at ease amongst civil servants and lobbyists. For Orange Bookers the entry into coalition with the Conservatives was a triumph. They could work with the more reasonable Tories easily enough. Entering coalition was for them the ultimate political goal, as the best way of putting their thinking into practice. The disaster inflicted on the party in the election was a severe blow. This strand of the party is likely to lose its prominence. Though I share a lots of its instincts, it was not really on board for the sort of reshaping of the country’s economics and politics that I think is now called for. And then come the Social Liberals. Who are they? They are in fact a rather diverse group of people, united mainly by their distrust of Orange Bookers – but who had not got involved in Community Politics either. They draw from both the party’s Liberal and SDP wings. The coalition helped consolidate the group, leading to the formation of the Social Liberal Forum (SLF). It would a mistake to infer ideological coherence on this group. There is a strong left-wing strand, with more emphasis on government action, taxation and benefits than you will see from Orange Bookers. But what seems to dominate its thinking is a sort of conservatism – notwithstanding ritual calls for radical new ideas. Pretty much any suggested reform of public services or benefits is opposed. “We want change, but not this change,” seems to be the motto. Some show a nostalgia for pre-Thatcher Britain, which I find rather bizarre. There are younger and fresher members of the SLF too – but for me it is too tainted with the narrow conservatism of older members. And this is above all what the party needs to leave behind. The sort of liberalism the party stands for is optimistic and inclusive. It appeals to younger people, and draws its main energy from them. And the party retains its appeal amongst the young. True, the party was way behind Labour and the Greens in attracting younger voters – but the party fared no worse here than amongst older voters. The rather youthful profile of new members shows that is values remain resonant. Labour remains heavily attached social control and conformity, and the Greens seem tempted by these ideas too. The Conservatives and Ukip are too interested in socially conservative older voters. There is a chance of building a strong appeal, based on younger people, that then extends across all age groups. What I want to see is a generational shift in the party. Us oldies have an important role to play – but our first job is to persuade our younger colleagues that our ideas have validity. It will mean that many old ways – Community Politics, Orange Bookery, and social Liberalism – will pass into history. But fresher ideas will emerge to replace them. Posted on May 28, 2015 Author MatthewCategories Politics UKTags Liberal Democrats8 Comments on Community politics, Orange Book, Social Liberalism. Time for the Lib Dems to move on. Will the Conservatives trip up? In my survey of the changed political landscape after Britain’s General Election it is time to look at the unexpected winners of that election, the Conservatives. Just as a pall of doom hangs over the defeated Labour Party, and an even darker one over the Liberal Democrats, a bright glow surrounds the Conservatives, who now have an aura of invincibility, to judge by the commentary. We form our opinions in such ephemeral ways. How well is this aura deserved? The Conservative majority is a narrow one. There is a huge gulf between them and the second-largest party, Labour, but if they lose thirty seats or so, a rainbow coalition of some sort could replace them, incorporating Labour, the SNP and the Lib Dems. Perhaps sensing this, the Tory leader, David Cameron, is making a bid for working class voters, especially those in northern England, to consolidate his hold on what I have called Middle England. These are voters employed by the private sector who view left-wing rhetoric about extending the state with scepticism. This is backed up by the Chancellor George Osborne’s “northern powerhouse” idea of restoring the fortunes of northern England through devolution of power and infrastructure investment. If this plan succeeds Labour could retreat yet further. Labour is badly shaken and is uncertain about what to do next; it can’t simply rely on mid-term government unpopularity to sweep itself forward: it badly needs a better narrative of its own. Meanwhile the Lib Dems have now lost the huge benefit they had of incumbency, and may be laid low for a very long time. A further factor is that the Conservatives could redraw constituency boundaries to secure themselves another dozen or so seats. There was a big kerfuffle about this in the last parliament – when the scheme was also part of a plan to reduce the size of the House of Commons – as it still should be, according to the Conservative manifesto. But British politics may be more fluid than the politicos think. Labour was supposed to have an inbuilt advantage on current electoral boundaries – but if I have understood the psephologist John Curtice correctly, this vanished in this year’s election. Since blatant, American-style gerrymandering cannot be done here, it could well be that redrawing the boundaries will have little actual effect on the balance, or even an adverse on on the Conservatives. Still, I think three things could upset the Tory bandwagon. The first, and most obvious, is Europe. Membership of the European Union (i.e. opposition to it) has been something of an obsession for many Tory activists for a generation. And yet the leadership clearly favours staying in the EU, fearing the uncertainties that would follow a withdrawal. The party has been close to tearing itself apart, and divisions contributed to its fallow period from 1992 (shortly after their victory in that year’s general election) until Mr Cameron assumed the leadership in 2005. Mr Cameron’s strategy is to lance the boil with an in-out referendum in this parliament. Will this referendum allow the party to bury the hatchet? Or will it cause civil war and either a Eurosceptic coup, or mass desertions of rank and file and even MPs? Mr Cameron’s victory gives him a lot of political capital in the party, and his views on Europe probably match those of Middle England very well. He may yet pull this off. Secondly there is the economy. It was economic policy that did for John Major’s Tories, when he was forced into a humiliating U-turn in September 1992 on the European Exchange Rate Mechanism. Divisions on Europe, and a revived Labour Party under Tony Blair simply finished things off. The British economy is not as strong as the government claims. It is too dependent on private sector debt and consumption, resulting in a substantial current account deficit. Moreover the standard econometric models, still used by almost everybody, including the Office for Budget Responsibility (OBR), do not account for many of the headwinds a modern developed economy now faces. The government has no answer to weak productivity, which underlies Britain’s mediocre economic performance and the failure of wages to advance. The fact is that economic performance is simply not in any government’s gift, and the outlook is cloudy. Not that any economic crisis, like that of 1992 looms. A new banking crisis cannot be ruled out, but the country does not look as vulnerable as it was in 2008. But slow growth, and even relapse to recession, is distinctly possible. This matters because the government’s financial plans depend on relatively optimistic predictions provided by those econometric models. If this is not forthcoming the government will either have to cut spending more deeply, or raise taxes, or borrow more. Each of these would be particularly difficult for a government that has set so much store by its “long-term economic plan”. It will be particularly poisonous if the government is forced to raise one of the tax trio of income tax, National Insurance or VAT – there was an election promise to enact a law against raising these. But what if the alternative was to renege on its funding pledge to the NHS? Such an invidious choice could well confront the government. And, of course, this problem could come together with the European one (as it did for John Major). If the country votes to leave the EU, or if it looks as if this is a strong possibility, then the adverse effects on the economy, in the short term at least, could be severe. The third threat to the Conservatives is more speculative. It is that the Tories are very old-politics when a sea-change could be coming. They favour minimal constitutional change – and such change as they do offer seems to be about handing more power to the executive. They look to older voters more than the young. They use classic old-style fear campaigns ruthlessly. This old, Westminster-centred politics was in bad odour before the election, and that the bad odour has gone away. Tory strength reflects their opponents’ weaknesses. Labour and the Lib Dems are just as tainted in electors’ eyes. Ukip’s foray into the politics old- fogeydom disqualifies them in the eyes of many. The Greens’ fantastical economics and obsession with abstract nouns (austerity, inequality, neoliberalism, etc) limits their appeal. Perhaps this general negativity reflects the national mood well, but the party should take heed of what happened to Labour in Scotland. The SNP’s success is not jut based on a nasty, narrow nationalism, though that is part of their formula. It also draws strength from an inclusive, bottom-up politics, that is not so heavily managed by spin-doctors and narrow calculations of electoral advantage. They have managed to ignite hope – and in the face of hope the old-politics world had no answer. Can the politics of hope be ignited in England? It should not be ruled out. Perhaps a breakaway faction from Labour or the Conservatives can set it off it, much as the SDP did in 1981. Perhaps a future Labour leader will have the vision to be part of an electoral alliance including the SNP, the Lib Dems, the Greens and Plaid Cymru, and based political reform, including a federal constitution and proportional representation at its heart. Such a brave and unexpected move could capture voters’ imagination, especially if the Tory reputation for sound economic management is wearing thin. It may well take another crushing defeat for Labour before they are ready to embrace such radical thinking. Whether the SNP might play ball I have no notion. But these are strange political times and we must dare to think the unthinkable. There is no inevitability about another Conservative victory. Posted on May 26, 2015 Author MatthewCategories Politics UKTags Conservatives, David Cameron2 Comments on Will the Conservatives trip up? Yesterday Britain’s Trades Union Congress (TUC) published a poll exploring the public’s attitudes to the Labour Party. The press release’s headline, “New poll has no easy answers for Labour but trust and competence key”, does not invite much interest. A poll that found easy answers, or which suggested that competence and trust could be taken lightly – now that would be interesting! Over 55s overwhelmingly picked the Conservatives over Labour by 47% to 24%. Labour did better amongst younger voters, but not overwhelmingly so. The survey identified 13% of floating voters that considered Labour but voted for another party (Conservative 35%, Lib Dem 23%, Ukip 17%, Green 14%). This group were much more worried about Labour overspending and the SNP – few mentioned Labour’s lack of sympathy for aspiration and success. This seems to run counter to the Blairite narrative, which drops in the word “aspiration” at any opportunity. The Conservatives were perceived to win on competence, while Labour were closer to ordinary people. The former was more important. The Conservative record in government was considered more competent than Labour’s. This is a tough message for Labour supporters, who, often passionately, believe the exact opposite. No doubt they will blame media bias. People tended to think that Labour was too soft on big business rather than too hard. This again seems to contradict the Blairite narrative that the party should cosy up to business again. Overwhelmingly people wanted Labour to be “tougher” on immigration and welfare. A hard message for not just Labour supporters but liberals of all parties. Perhaps it is not so surprising that voters preferred by 77 to 15 “concrete plans for sensible change” over “big vision for radical change”. Another place where political activists seem distant from the public. Of course this tells us as much about how issues should be framed as it does about what is likely to change voter behaviour. Voters may want parties to be tough on big business, but constant battle with business would probably undermine any idea of economic competence. If you have a big vision for radical change, it is clearly important to present it as if it a concrete plan for sensible change. That Politics 101, as the Americans might say. The bigger message is that the idea of competence is critical for any political party that aspires to government, rather than merely protest. This isn’t a new idea, Mark Pack, the Lib Dem uber-blogger, has made this point recently. He rather spoils it by using the jargon word “valence” to describe it, a word that is conjures up the idea of atoms and chemical bonds in my brain. It is important because many political “strategists” tend to focus on policies instead. They see their job as identifying a set of popular policies through polling and focus groups, and then using these to win votes. Labour certainly seemed to think this way, and so did the Lib Dems. The Lib Dem post-election survey had this idea hard-wired into it. What policies would have made a difference, it asked (or something similar). That was irrelevant, was my answer. The Conservative election maestro, Lynton Crosby, did not make this mistake. Their campaign was based on the juxtaposition of competence with chaos. So political campaigners need to think hard about how the public develops its judgement of competence. Actual competence is not enough. By and large the Lib Dems record in coalition was highly competent – but the public gave the party little credit for this. The tuition fees fiasco seemed to loom larger. Maybe that isn’t quite fair and the party was more damaged by the fact that it could not lead the next government, nor would it state is preference of which party it would team up with. For the Labour left though, the competence problem is a big one. It is very hard to be a party of competence and a party of protest at the same time. Almost certainly the public associates free spending and higher taxes with a lack of competence. Tony Blair (another politician that grasped the dominance of competence over policy) understood this clearly. Labour has to embrace at least some aspects of what it calls “austerity” in order to build trust. And they need to find ways of doing this that aren’t just hot air. Their leader has to show that they can face down internal opposition and embrace party division in order to push such polices through. So the prime requirement for Labour’s next leader is bloody-mindedness, and an ability to push through policies that trade union backers and many activists will dislike. On this score Yvette Cooper looks the best bet. Her chief rival, Andy Burnham, looks too flexible. The potential third candidate, Liz Kendall, is the one I personally find the most attractive – but she has much less of a track record, and their must be doubts as to how much clout she would have if she won. After a bit of introspection on the sorry state of Britain’s Liberal Democrats, I am moving on to consider the not quite so sorry state of the Labour Party. The party was all but wiped out by the SNP in Scotland, experiencing some of the most spectacular swings ever seen in British politics. In England and Wales the party completed the Conservative demolition of the Lib Dems, picked up George Galloway’s Respect seat, but made little headway against the Conservatives, even losing some seats. And that from a historic low point in 2010. It was its worst result in seats in the post war era. What to make of this? This bad result has led to not a few doom-laden pronouncements from party insiders and columnists, about how the party could be out of power forever unless it sorts itself out. My first reaction is to remember the quote from Macbeth: “It is a tale told by an idiot, full of sound and fury, signifying nothing”. I remember similar pronouncements after the 1992 election… before a turn of events that led to Labour’s biggest ever victory in 1997. The Conservative majority is narrow, and that party is riven by its own divisions, notably over Europe. In England Labour has convincingly seen off its main rival, the Lib Dems. Another rival, the Greens, and Plaid Cymru, its main rival in Wales, failed to advance. Ukip, its last important rival, looks in complete disarray. But it won’t do just to blame Labour’s defeat on tactical mistakes by its leader Ed Miliband, who resigned after the result. It was clear enough what direction Mr Miliband was going to take when he stood for the leadership in 2010, and overall he delivered it with a great deal of competence. Most Labour insiders were, as Mr Miliband memorably said of the Lib Dem association with Tory policies in coalition, complicit. He, and most of the party, wanted Labour to bounce back quickly, with a smart step towards its roots on the political left, but without having any major internal political bust ups on policy. They were relying on the coalition parties to lose the election, rather than get onto the front foot themselves. We must remember that in those early coalition years, with the scale of government cuts becoming evident, that there was outrage. Those on the left saw what was happening as an evil attack by the privileged Tories on wider society. Those of a more centrist viewpoint were persuaded by Keynesian economists that the government was making a catastrophic error. The two factions could unite in their condemnation of the government without having to agree on the optimal size of the state, or how to lift economic productivity. By the time it was clear that the economy was not going to take a downward spiral, whether through the government’s sound judgement or through sheer good luck, it was too late to have these searching conversations. Labour’s criticisms of the government’s economic record resonated with the public, but the party was unclear on how it was going to do any better. It developed a few eye-catching policies, on energy prices and the minimum wage for example, which were individually popular, but did not add up to an economic strategy. This left the party with little traction against the Conservatives, even as it was clearly scoring against the Lib Dems. They seemed to think that would be enough, with what was dubbed the “35% strategy”. It turned out this was not enough – they hadn’t reckoned on a number of things: that the Tory squeeze on the Lib Dems would be just as effective as their own, and that there would be significant leakage to the Greens and Ukip. But the real disaster, that most Labour insiders had not foreseen, was the meltdown in Scotland – even after the SNP’s sweeping victory in the 2011 Scottish elections. This seems a wilful failure to face up to realities that were too awful to contemplate. Labour’s political representation is based on a bedrock of support in the old industrial centres where the party is virtually unchallenged, especially in opposition. Scotland was a large part of this. There was (and is) a sort of grand bargain. These areas provide safe seats for Labour’s Westminster elite, allowing them to concentrate on their careers in the capital without connecting much with local voters; meanwhile local party bosses had a pretty free hand to run their fiefdoms using the good old-fashioned politics of patronage and menace. Local voters were unhappy with this, but where else could they go? In Scotland the SNP patiently built up a position as a clear alternative – and then pushed the whole rotten structure down. Labour’s crass handling of the referendum on Scottish independence did not help their cause, but the roots of their problem lie in generations-old institutional failure. And those failed party institutions live on in Labour’s heartlands in England and Wales. They are vulnerable to a similar collapse – though its source is unclear. Ukip now seem to be a clear challenger – but they will need more organisational nous to develop that threat. Some Conservatives aspire to mount a challenge, but they have a lot of class baggage to overcome. The Greens are middle-class lefts who fume at abstract nouns (“austerity”, “the Market”, and so on), and not the sort of gritty campaigners needed for this sort of work. The Lib Dems blew their credibility with the coalition and it will take a long time to rebuild it, if they ever can. So matters look safe for now – but the party should beware of taking its regional base for granted. So the party has a difficult manoeuvre to undertake. It must become more Tory to win back voters from that party. It must rebuild in Scotland, providing a compelling critique of the SNP’s record in Scottish government. And yet it must reassure its core voters. It delivers something to Labour’s neglected heartlands away from the capital. It is also one of the more promising directions to revive the country’s lacklustre economy. Alas such devolution runs counter to the party’s instincts. Its reaction to the coalition’s devolution deal for the NHS to Greater Manchester was revealing. Andy Burnham, its then health spokesman and now a front-runner in the leadership stakes, trotted out all the old tropes against devolution, and damned the concept with faint praise. Still, Mr Burnham has proved flexible in his beliefs before now, and he may yet get it. The party’s priority for now, though, is to pick a leader capable of leading the party through this minefield. As the FT’s Janan Ganesh points out, this isn’t a matter of providing a clear vision. It is a matter of solid political judgement, and the strength to weather internal controversy. The jury is still out on the various contenders, and I wouldn’t write any of them off for now. The Liberal Democrat catastrophe in last week’s British General Election (57 seat to just 8), has a rather bewildering sequal. A membership surge. More than 10,000 new members have joined since the election, as the total membership shot past the 50,000 mark. In my not very active local party some 95 joined. We only had about 120 to begin with. I haven’t met any of these new members yet. Some are old ones rejoining; most are not, apparently. These membership surges seem to be something of a feature of modern British politics. This surge is dwarfed by the one the SNP had after last year’s Scottish independence referendum; but more similar to one the Green Party had earlier this year. It seems to be a matter of the party’s current voters choosing the moment to rally round – rather than floating voters suddenly being persuaded. Encouraging though this is, it must not stop the party asking hard questions about itself. Now is the best time to have a far reaching debate. Labour’s failure to take on such a debate after 2010 was one of the reasons it failed this time. And for me the biggest question is how the party seeks to influence national politics. Until now our strategy has been this: establish a base in local politics, based on very localised campaigning, preferably using the idea of community politics. The party then selects a parliamentary candidate who builds on these roots, makes extensive local contacts, and then wins based on being a “good chap” (and somehow it usually is a chap, and a white middle class one at that) working hard for the local community. The weaker of the two main parties would first be overhauled, and then their supporters ruthlessly rounded up on the basis that it was a “two horse race”. The bar chart supporting this at the top corner of every leaflet became an institution. Sooner or later this builds up into being a decent block of MPs, who achieve national influence by entering a coalition government. One day the party might lead such a coalition. and then govern on its very own as a majority. This strategy has been called winning Liberalism one ward at a time. The flaw in this approach has been exposed brutally. At the General Election the question that most voters want to determine is who leads the national government. This trumps the “good chap” card. In Bermondsey voters told the party that they loved Simon Hughes but did not want to risk another Tory government, even one moderated by coalition with the Lib Dems. In Kingston they said that they liked Ed Davey, but that they wanted to stop a Labour government over which the SNP could exert a stranglehold. The trouble is that the party has drawn in a lot of voters only loosely aligned to the party’s core values, many on a purely tactical basis to stop whichever major party they disliked most. And the party drew such support from both Conservative and Labour inclined voters. After coalition with the Conservatives, Labour inclined voters felt betrayed and deserted the party. The Tories then moved in on the weakened party and mugged it. The same would have happened the other way around if the party had formed a coalition with Labour. And if the party had stood aside? Then what was the point of electing those MPs? Both major parties would have attacked on the basis of it being useless flotsam. So what to do? One idea that has been doing the rounds is to build the party’s core vote. That means clearly articulating the party’s core beliefs and drawing in much more loyal support on that basis. This is contrasted with the much weaker “centre ground” strategy of defining the party on the basis that it is in between the other two. Well, yes. The party needs a core of motivated activists – and there is a clear set of values around which the party can base itself. But how wide is the appeal of those values? The party’s standing is now about 8% of those who voted (or 5% of the whole electorate). In the Netherlands, which has a more diverse and plural polity, the party’s closest equivalent, D66, gets about this level of support. Can the core be expanded much beyond this? The party still needs to persuade those less convinced of the party’s core values to vote for it – which brings it back to local action and the centre ground (i.e. being everybody’s favourite second preference). Building the core is not wrong – it just doesn’t help much. The key point is this. The party cannot go into an election without a clear position on who it wants to lead the next government – perhaps stated in the negative (i.e. which of the main parties it is against). Simply saying that the party will wait and see won’t cut it. It’s abdicating from a decision that most voters want a say in. That brings with it a host of further questions and problems. It would surely limit the party’s electoral appeal in marginal seats. It ushers in questions about pre-electoral pacts. But avoiding the question invites doom. And I think this leads to a second question. How much to we want political reform? Electoral reform to institute a proportional voting system and more pluralistic politics; some kind of federal system to place the the nations and regions of Britain on a stabler constitutional footing; more devolution of power to local and regional level; making it harder for big donors to influence politics; a directly or indirectly elected upper chamber. Such reforms used to be at the core of the party’s pitch to voters – especially under Paddy Ashdown’s leadership in the 1990s. Subsequent leaders felt that such reform attracted too little public interest, and that the party should focus more attention on “bread and butter” issues, like education and taxes. The party did have a problem in those days: political reform was focused on electoral reform, and the party’s position looked self-serving. Nowadays people profess a greater disillusionment with politics (though participation in General Elections seems to be creeping upwards) and this might be channelled into political reform. But a reform programme stands a better chance if it has cross party and non party support. If the party wants political reform it must place it back at the top of its agenda, and make it the basis of any alliances or pacts it makes with other political parties. If it doesn’t, and it has to be admitted that the British public is still quite sceptical about reform, then the party needs to find another defining issue around which to make its relationships with other political parties clear. The big game is this: the party needs an electoral pact with one or other of the two major parties. Or with a breakaway from one or other of these parties. At the moment that looks a distant prospect. But we have time. Something like the breakthrough needed happened in 1981 when the SDP was formed and then allied with the Liberal party. That peaked too soon and failed. But it showed that new ideas can catch the public’s imagination and turn the system upside down. The SNP has achieved this in Scotland, albeit by a different route. It is possible for hope to trump fear. But what the party mustn’t do is go round the same old merry-go-round again. After last week’s earthquake it is tempting firstly to debate party strategy for the Liberal Democrats, and then to gloat a bit over Labour’s ineptitude. But such an inward focus on the political left and centre-left is one of the reasons why these parties got into such trouble. I want to think about that key group of voters that I will call Middle England. These are the voters that plumped for the Conservatives, and won them the election. What I will develop is a bit of an archetype. It is not based on scientific evidence – though anecdotal evidence from the campaign trail forms part of the picture. What I am creating therefore is a bit of a myth. But I think it will help to think about politics in a different way – and the validity of any new thinking that flows from it can then be tested to proper evidence in due course. The Middle England voter is predominantly suburban and middle class, but includes much of the established working class too – by which I do not mean those struggling on the margins of poverty and state benefits, which is what some seem to understand by the term “working class”. These voters exist in large stretches of Wales as well as England. I read that Scottish voters are much more similar to English ones than is popularly realised – so similar voters must exist north of the border too in large numbers too. But their voting behaviour was different, and should be considered on a different occasion. What do we know about such voters? The Tory brand is not toxic to them. This makes them stand apart from most of the urban middle classes with whom I associate, and the more tribal working classes. Middle England does not regard itself as dependent on the state, and its sense of wellbeing is affected by taxes. This gives the Conservatives an opening, and make Middle England voters particularly suspicious of parties that are profligate with state spending. But they are open to voting for other parties. This makes them a critical political group – they are swing voters. They voted for Tony Blair’s New Labour; large numbers voted Liberal Democrat between 1997 and 2010. Ukip has fished in these waters too. They like great British institutions like the NHS, state schools and the old age pension. They accept that they must pay taxes to fund these things. They are distrustful of the political and business elites. They mainly work in the private sector. This is perhaps the critical point, and one that separates them from the modern political class – who build their careers within, or on the margins of, government and the public sector. Middle England voters are used to the rough world of competitive markets and to the disciplines that flow from it, such as constant performance appraisal and being forced to rethink the way you work. They face many insecurities, and their life depends on the health of the economy – but they do not think that these things depend on government spending and regulation, in the way that much of the political class seems to. It would be easy to build up this characterisation further, and speculate on property ownership, newspaper readership and other things. But I think that this is enough for now. What seems to have happened is this: Middle England largely backed Mrs Thatcher’s Conservatives in the 1980s, but deserted her as her government seemed bent on taking apart precious British institutions. In 1992 they were persuaded to stick with the Conservatives under John Major, in a campaign with a striking similarity to this year’s. But Tony Blair offered them what they were looking for, and they switched en masse for his party in 1997. In many parts of the country they favoured the Lib Dems, as being a sensible party of the political centre. In 2010 Gordon Brown’s Labour lost them. The economic crash of 2008 swept away Labour’s reputation for economic competence and strong management of the state’s finances. And they were getting grumpy over the government’s tendency to nag and nanny them. But by and large they stuck with the Lib Dems. And Middle England does not appear to have been too upset with the coalition that followed – though doubts grew about the junior party. This year the Conservatives secured the Middle England vote in a ruthless campaign that reached under the media’s radar. The Lib Dems were already weakened by the loss of votes to Labour (the party’s other key constituency of left wing sympathisers disillusioned with New Labour), and their seeming irrelevance in seats outside their areas of strength. Middle England voters in areas of Lib Dem strength were the main focus of the Conservative campaign. Their weapon was fear of a Labour government, particularly one dependent on the SNP – who were seen as being after English taxpayers’ money. Labour played into Tory hands. They made no serious attempt to recover the Middle England vote. They didn’t think they needed it. Their appeal was to public sector dependants, younger idealists fired up by ideas of “social justice”, and poorer people in urban areas affected by benefit reforms (especially here in London). All they needed to do, they thought, was to hang on to their core support and sweep up defectors from the Lib Dems. Labour took some care not to appear profligate, and claimed that their plans could be financed by cheap borrowing and taxes on people too rich to be considered Middle England. They assumed that everybody knew that “austerity” had failed. But this sounded suspiciously like empty political words. It was particularly damaging when Ed Miliband refused to seriously criticise Labour’s previous economic record, notably on the Question Time TV show. It didn’t help Labour that the SNP’s Nicola Sturgeon banged on about fighting austerity at every opportunity. “Austerity” is a bit of a political class jargon, but the public soon started to understand that it was synonymous with what they understood as prudent financial management. Labour and the Lib Dems clearly also hoped that the Tories would be fatally wounded by the rise of Ukip. But where it mattered the same ruthless Tory campaign was able to limit the damage here. So the Tories swept away the Lib Dems and contained any Labour advance in England and Wales. Now Labour and the Lib Dems must confront the damage done. They can’t rely on a Tory implosion over the next five years – though that is a possibility. Unless they can reduce the fears of Middle England neither party will win back power. Labour leadership candidates at least seem to understand this. But whether they can drag along their activists and trade union supporters in a single parliament remains open to question. I will return to the Labour predicament in a future blog. The problem for the Lib Dems looks even worse. Their electoral strategy of local do-gooding and scooping up tactical votes is incompatible with coalition government, and a core values appeal does not look able to secure anything like enough votes in enough constituencies. I will blog about that in future too. But what we need to contemplate is a complete change to the political landscape. The idea of a natural “progressive” (or left-leaning) majority in England is well and truly dead. If you add Ukip’s vote to the Conservative one in England you get 55%. To appeal to these voters you cannot throw public money at all your favourite causes, bang on about about “social justice”, or whinge about austerity. The left has been living in a dream world for the last five years, and ignoring the worries of Middle England. But all is not lost. The Conservatives won’t have it easy either. Their tendency to attack sacred British institutions remains. By all accounts many of their voters are reluctant ones. What politicians of the left must recognise is that this is the key electoral battleground – and not the politics of protest and chatter amongst people who share your own outlook. Long live democracy! It often seems that the political left here in Britain wants to take Britain back to the 1970s, with its nationalised industries, high taxes and free ways with government money. In one respect they will have their wish after yesterday’s General Election. The Liberal Democrats have been more or less destroyed as a political force – reduced to their state in the 1970s, leaving English and Welsh politics mainly a battle between the Conservative and Labour parties. That the left were still trounced, even with the Lib Dems disposed of, may give leftists pause for reflection, though. They should not take much comfort from the triumph of the Nationalists in Scotland, based on a leftist manifesto. I want to take some time to reflect on the Lib Dem catastrophe, and on the remarkable results of yesterday’s election. But in this day and age quick commentary is valued more than considered analysis, and this blog makes some attempt to bow to that demand. So here are my first thoughts. First: it hurts. Really hurts. I have supported the party’s leadership. Four defeats I feel acutely. Simon Hughes in Bermondsey – whom I helped yesterday. There can be no MP with a similar record of local service. I also helped Ed Davey in Kingston & Surbiton in the campaign. He achieved his seat after requiring a Chair’s reference from me! I had high hopes of two younger candidates, whom I had the privilege to serve as agent in the last five years when they were part of the party in Wandsworth: Layla Moran (Oxford West & Abingdon) and Lisa Smart (Hazel Grove). All were swamped by the anti-Lib Dem tide. There are plenty more tragic losses. A number of my Facebook friends have criticised the leadership in their first thoughts. The “neoliberal” policy outlook which made coalition with the Tories so much easier (in this context the term means going along with austerity policies, and some mildly market based reforms of public services); the decision to play for the centre ground in electoral appeal; keeping Nick Clegg on as leader after he became politically toxic. By and large these criticisms come from team players in he party, whom I respect. They have been holding back for years in the name of party loyalty. So I can’t begrudge them voicing their frustrations now. But I supported the leadership on each of these issues. I am not sure that the party could have avoided an equally bad fate by doing things differently, after the hospital pass of the 2010 election result. If the party hadn’t entered coalition with the Conservatives, it would have invited the question of what the party was for. No alternative coalition was on offer. The party helped soften austerity policies, which were simply a recognition of economic and political facts – the size of Britain’s state was unsustainable. The pitch for the centre is a fact of life in our current electoral system. Parties who made a sharper appeal to values, the Greens and Ukip, fared disastrously -and Labour’s more value-driven appeal left voters cold. Changing Nick Clegg as leader would have destabilised the party’s achievements in government. If I have a serious criticism of the the party leadership, it is that it dropped political reform from its central platform – a process started by Charles Kennedy, but continued by Mr Clegg. Whether that would have made much difference is another matter. The national political story trumps the local one. One favourite Lib Dem myth is that the party can achieve power one ward at time: in other words based on local record of campaigning and action. But in elections in each of the last four years Lib Dems have been swept away at all levels of government, based largely on the party’s national popularity. The party is nothing without its local record – but that is not sufficient. The party can be rebuilt. But it must focus on a vision of tomorrow, and not recovering its glory days. The party must draw in younger supporters and let its agenda be guided by them. And especially its representatives must be a more diverse bunch. All this points to different styles of campaigning. Us oldsters are facilitators now, not leaders. One thing we can learn from the past is that the misfortunes of Labour and the Conservatives can give the party strength. Both these parties are fragile coalitions. If one of them fractures, as Labour did in 1981, something with real political momentum can be created. But to benefit the Lib Dems must be able to reach out to those formerly belonging to other parties. This election reminds of 1992. I will reflect on the striking parallels in a future blog (though I have been saying this for years). That election created a crisis of confidence on the political left. We must remember the sequel though. The Conservatives won against expectations, only to crash to their worst ever defeat in the following election, which was a triumph for both Labour and the Lib Dems. The Tories are riven by similar divisions over Europe. Something similar may happen again. With the Conservatives in power, political reform will not be high on the agenda, except to extend central executive power yet further – though I do hope they start thinking more creatively on a new settlement with Scotland. And yet I think there is no more important issue for Britain. And that’s enough for now. I will now have to endure the gloating of Lib Dem critics. And after that being treated as a political irrelevance. It seems that my political commitments bring almost nothing but pain. But I keep hoping for better. This blog will go on. was going quite well. They neutralised their vulnerability on the economy and tax. Their campaign on the NHS was dishonest but largely unchallenged. Their portrayal of the election as a choice of values had some resonance. And then it went wrong. Ed Miliband, their leader, has shown a disastrous lack of judgement – he is setting himself up for an impossible task after election day. And that could be disastrous for the left in Britain. A strong economic foundation. That means getting to grips with Britain’s low productivity and producing steady economic growth, not based on a current account deficit or (much the same thing) increased public or private borrowing. But this means addressing the deep-seated economic problems, which have emerged over the last 10-20 years, and which nobody really knows how to fix. Quite apart from the threat of the world economy blowing the whole thing off course. Higher living standards for working families. Ditto, with the added dimension that incomes for lower and middle tier workers must be raised. This will take more than tinkering with the minimum wage. An NHS with the time to care. Oh dear! The NHS faces a severe crisis of resources as the burden on it grows. No government can hope to do much more than run hard to stand still. Controls on immigration. Just what on earth do they mean? Labour have made a point of not challenging the country’s status in the EU (a stance with which I agree) – which means that direct controls on much immigration will be impossible. In fact all they have talked about is curbing the rather fictitious problem of benefit tourism, and chasing after exploitative labour brokers. If the economy does well, there will be more immigration; if it doesn’t Labour will be in trouble on its other “pledges”. A country where the next generation can do better than the last. This may not be so difficult to keep, with a bit of judicious definition – it is probably true already. But if the economy disappoints, as seems certain in view of the headwinds, then nobody will believe that it has been kept. Homes to buy and action on rents. This is perhaps the most like a true pledge. Whether a Labour government’s action would be enough to have a discernible effect on the housing market would be another matter. We are still likely to be in a housing crisis in five years time. So as time passes, any Labour government’s progress against these aspirations is bound to look disappointing. So what would Mr Miliband say? Look at the small print, probably. 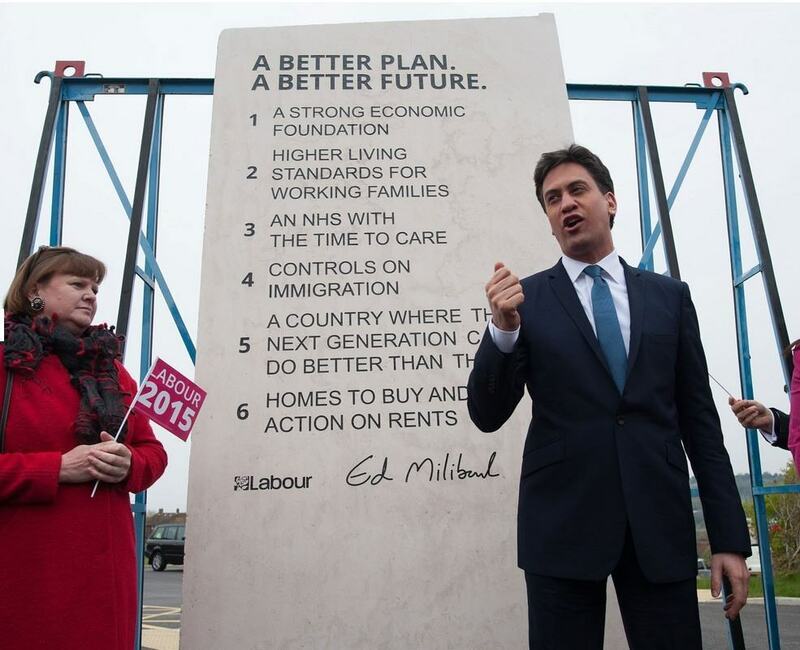 Each “pledge” is backed up by a more detailed and achievable to-do list in the main manifesto. But this detail isn’t on the tablet, and this excuse will look like classic political evasion. Or he could say that failure was due to circumstances beyond his control (which would most likely be true). And yet Mr Miliband has repeatedly claimed that he will under promise and over deliver. Something really doesn’t add up here. There is something else, though, about what Mr Miliband has been saying over the last week, starting with his Question Time performance last Thursday. He has said that if he does not win a majority, he will not deal with other parties. Specifically he was pressed on the SNP – but my understanding of what he said is that he excluded any other party. He wants to put up a Queen’s Speech and a Budget, and dare the other parties to vote it down. Given that he may well be given the opportunity to form a government even if he has less seats than the Conservatives, this does not sound at all wise. Even if he gets away with his Queen’s Speech and first Budget, he still has to manage the routine business if government – and the House of Lords will not respect his manifesto commitments without a majority. In some shape or form he is bound to end up doing deals – and the other parties will have no incentive to make it easy for him. This will lead to yet more fudge and evasion. It also looks like closing down too many options, too early. Behind all this lies a deeper problem. Mr Miliband is deep inside the tribal Labour bubble – which does not acknowledge that political movements outside the Labour Party have any real claim in the political realm. Other parties (or people outside parties) are either class enemies and beyond the pale, or they are fatuous fringes. This outlook leads to a certain sort of political blindness. He doesn’t understand that it is perfectly democratic to compromise on his manifesto if he hasn’t actually won an electoral mandate for it. Neither can he see that the sort of soft, aspirational phrases that appear on the tablet just look like political hogwash to most people. I am reminded of Labour’s campaign in the Wandsworth Council elections of 1990. The party was close to taking power at a time when the Conservatives were not doing well nationally. They fought a glossy campaign with an appeal to values. Their final pitch to voters said: “The Wandsworth Conservatives know the price of everything and the value of nothing.” To Labour activists this no doubt felt like devastating critique of their opponents that would ring true with electors. The Tories won by a landslide, from which Labour never recovered. Labour’s near religious conviction in their moral superiority cuts little ice with the voters – or the ones they need to persuade. Labour are failing to get through to uncommitted voters, and they are painting themselves into a corner when it comes to what happens after the election. This at a time when they have a historic opportunity. With a little imagination a Labour leader could create an anti-Tory coalition that could place that party in dire trouble. Instead they are inviting disaster. Public confidence in the party has already collapsed in Scotland; that sort of thing can happen elsewhere if they continue to act is if they are the only show in town. Most voters do not want a Conservative government. But Labour is ineptly led, and courting a collapse (after this election) that could let the Tories in for a generation. Voters on the left should spread their bets a bit. The Lib Dems are far from a perfect receptacle for left leaning voters – another coalition with the Conservatives is a clear possibility. But an unmoderated Tory government would be much worse. And if the other alternative is the sort of Labour calamity government that seems to beckon – I would argue that this would be worse for the left than even another Tory-led coalition.